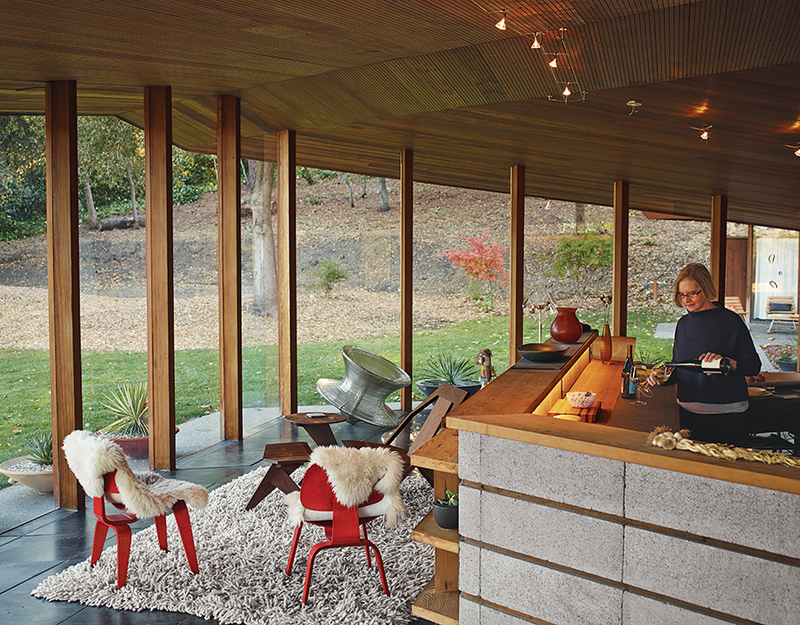 Katherine Lambert, a partner at Metropolitan Architectural Practice (MAP), and her business associate Christiane Robbins, painstakingly restored a 1950s redwood-and-glass house in Napa, California, originally designed by Jack Hillmer of Telesis. Lambert pours wine in the kitchen, which is defined by a low concrete-block wall and serves as the home’s central core. The seating-area chairs are from Herman Miller. MAP restored the original kitchen cabinetry; the faucet is from Arwa. The concrete continues in a bathroom, with an MGS faucet and a toilet from Foshan Fuly Bao. 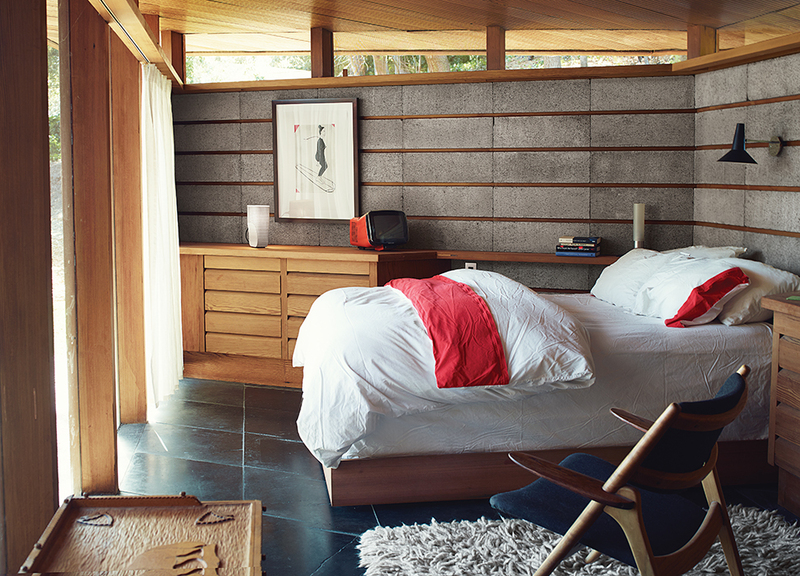 In the bedroom, a Margaret Kilgallen print joins a Brionvega Algol television, lamps from Patricia Urquiola and Pablo, and a Hans Wegner chair. A John Baldessari photograph rests on a shelf above a built-in desk just around the corner from the kitchen. In 1950, Milton Munger, a submarine engineer at Mare Island Naval Shipyard and a founding member of the Sierra Club, commissioned Hillmer to design his family home in Napa, California. Hillmer’s plan consisted of a hexagonal spiral with every corner angled at 120 degrees, forming a shape that resembles a dented nautilus shell from above. The home was constructed using only four materials: unfinished old-growth redwood, glass, concrete, and stainless steel. A central core, housing the kitchen, begins with a one-concrete-block-wide wall, aligned with the sun’s position at the winter solstice; neighboring walls spiral outward at two, three, and then four custom cinder blocks wide. The kitchen counter (five blocks wide) aligns with the sun’s angle at the summer solstice. The structure was one of the first passive-solar homes in California. Cinder-block walls unfurl outward along the northern and western axes, shielding the house from the summer heat, while glass walls open up the south and east sides to the outdoors. A folded plate ceiling—improbably complex for the pre-CAD era—is carefully calibrated to the angle of the sun throughout the year to optimize heating and cooling. The house is both romantic and a marvel of engineering, and its origin reflects the all-too-often-overlooked collectivist impulse of modernism: Munger, who lived across the street for years, built the house himself, with a great deal of help from his neighbors. Yet, after half a century of wear and tear—made worse by the fact that Munger had never quite finished the place—the house was falling apart. In 2011, its second owner, a contractor, put it on the market. But even its unique principles and pedigree weren’t enough to dissuade many prospective buyers from plotting a teardown. Leaks and floods had been a regular occurrence, thanks to the slapdash construction of the central utilities column, which was topped by a piece of acrylic glass held in place by rocks. Redwood beams, ceiling panels, and an extensive network of built-ins were blackened with dirt and were rotting in spots. Glass doors lacked thresholds, inviting in a steady migration of scorpions and spiders. Conduits had been left exposed along the floor; uncovered wires led to what Lambert calls “ghastly” fluorescent tube lighting. The boiler was inoperable, rendering the original radiant-heat system useless. Eaves were pockmarked with woodpecker holes, which the owner had attempted to fix by stuffing rolled tube socks inside. Yet the spatial ingenuity and ingrained sustainability of the structure were too alluring to resist. 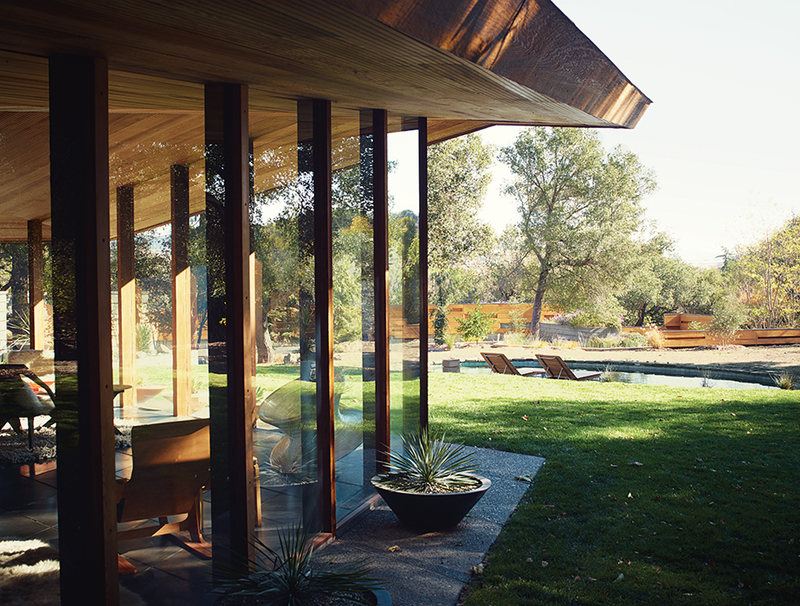 As they studied up on Hillmer, Lambert (whose portfolio includes a community of rammed-earth cottages in the Sonoma Valley) and Robbins (who is making a documentary about Gregory Ain) felt an emotional and intellectual connection to the man, his principles, and the house itself. “We were fascinated by how one moves through the space and how the spaces flow together,” says Lambert.